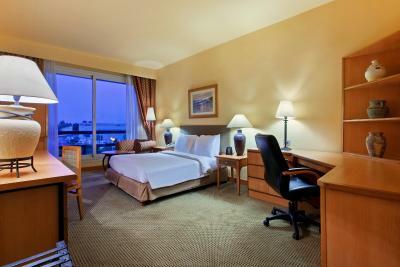 Lock in a great price for Hilton Alexandria Green Plaza – rated 8.2 by recent guests! On site of Green Plaza Mall, this Hilton is only steps away from 370 shops. With two outdoor pools, it also features a sun deck and fitness center. Alexandria Al Nozha Airport is 10 minutes’ drive away. 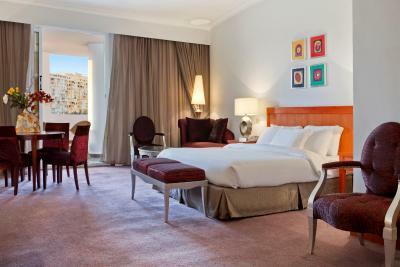 The Art Deco-style rooms at the Hilton Alexandria Green Plaza Hotel provide plenty of space. Each air-conditioned room includes a work desk, mini-bar, coffee making facilities, satellite flat screen TV and a Hilton Radio Alarm Clock. 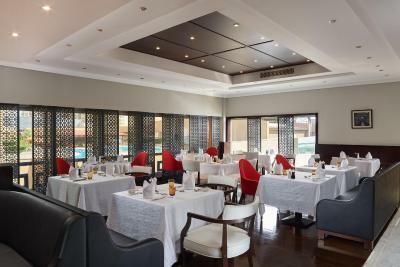 Guests can sample pizza, pasta and other Italian delicacies at the Splash Italian Restaurant or enjoy breakfast and dinner at the main hotel restaurant Abu Kir. 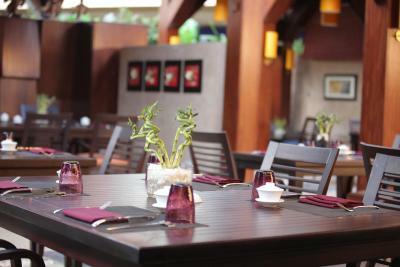 Ginger Asian restaurant serves Chinese, Japanese and Thai cuisines in a warm and friendly atmosphere, Nefertiti Lobby Bar and Lounge where you can enjoy a snack or a light meal, Aqua Blue Pool Bar is for a refreshing drink or a light meal as well. 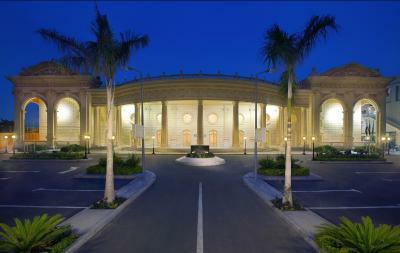 The property features an Executive Lounge, two business centers and 15 meeting rooms for 3,500 people. 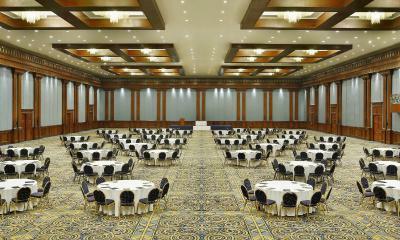 The Al-Zahraa Ballroom is among the largest conference rooms in Alexandria. 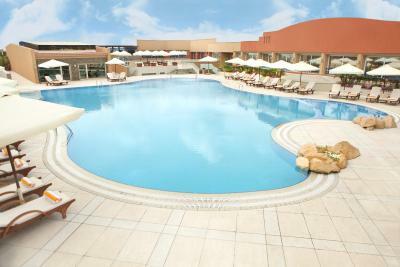 Entertainment options at Hilton Alexandria include a cinema, bowling and horse riding at the hotel’s ranch. 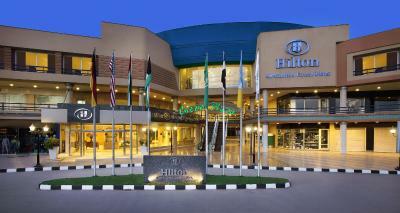 Sightseeing tours can be booked at Hilton’s 24-hour reception. Borg El Arab Airport is 45 minutes away. 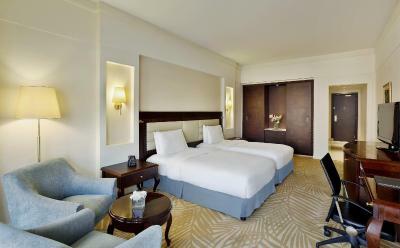 When would you like to stay at Hilton Alexandria Green Plaza? 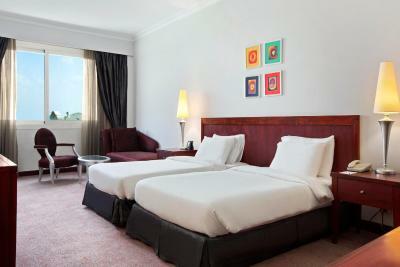 Relax in this comfortable Twin Guest room with twin beds. Stay connected with WiFi access (fees apply) or catch up on work at the desk with easy chair. 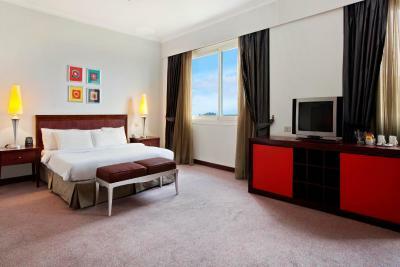 Enjoy a drink from the mini-bar or watch a movie on the LCD TV. Reinvigorate yourself in the bathroom with separate shower. Additional features include coffee making facilities and daily newspaper. Sleeps 2 adults, 2 children under 12 years. 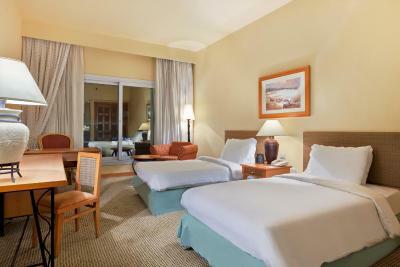 This Junior Suite featuring queen-sized bed offers added space and comfort in stylish surroundings. 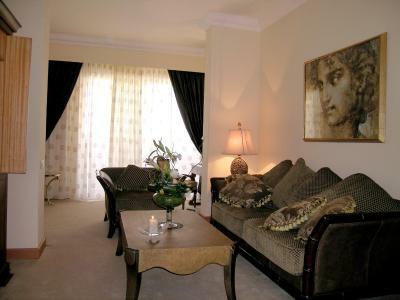 Relax in the separate living room with sofa or watch movies on the LCD TV. The room features a large work desk and an elegant bathroom. Special touches include fruit basket, bathrobes, slippers and daily newspaper. Sleeps 2 adults, 2 children under 12 years. 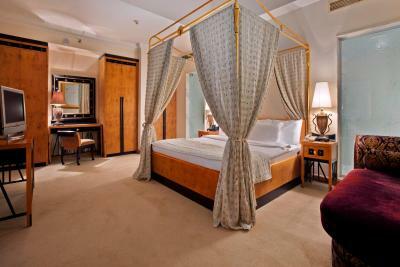 Experience a comfortable stay in this elegant room with queen-sized bed. Watch a movie on the 37-inch LCD TV and stay connected with WiFi (fees apply). Get to work at the desk with easy chair, or listen to your favorite tunes on the Hilton alarm clock radio. Additional features include tea and coffee making facilities and a daily newspaper. Sleeps 2 adults and 2 children (under 12 years). Business is a pleasure in this comfortable Executive room featuring a queen-sized bed and flexible work environment with large desk. 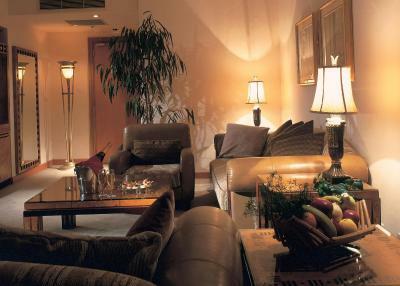 Benefit from Executive Lounge access which includes complimentary breakfast, refreshments for the day and WiFi access. 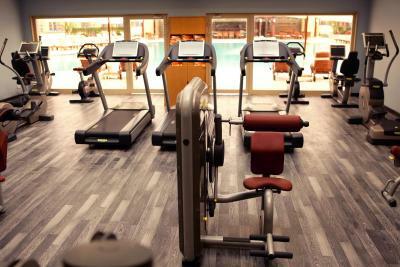 Take a break and watch the news on the 37-inch LCD TV or stay connected with our WiFi access. Sleeps 2 adults, 2 children under 12 years. 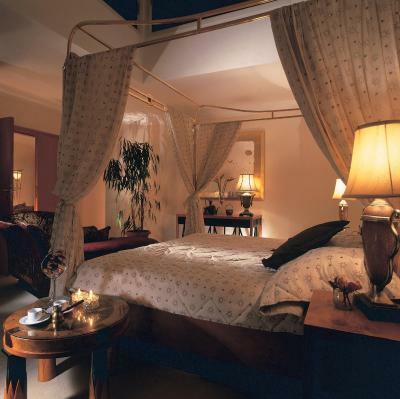 Indulge in this lavishly furnished Royal Suite with one queen-sized bed and a separate living room. Work in comfort at the desk area, check your emails with WiFi (fees apply) or relax on the sofa. Special touches include fruit basket, bathrobes, slippers and daily newspaper. Sleeps 2 adults, 2 children under 12 years. 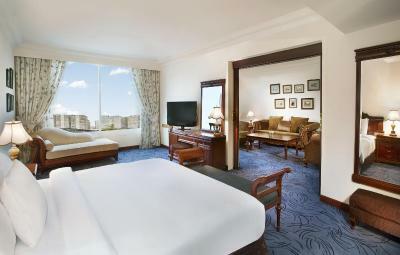 Overlooking the mall, this air-conditioned room offers a flat-screen TV, a mini-bar and a tea/coffee maker. The private bathroom has a bathtub or shower with a handheld showerhead, as well as slippers and complimentary toiletries. 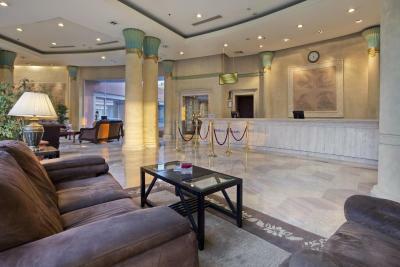 - Complimentary Wi-Fi access in the lounge . 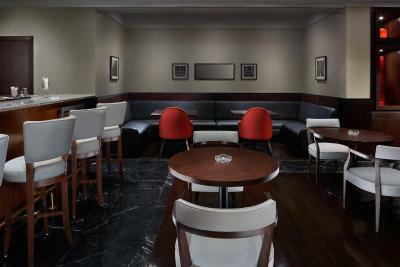 - Benefit from Executive Lounge access with complimentary breakfast, snacks and refreshments all day. Executive Lounge access is for adults only. 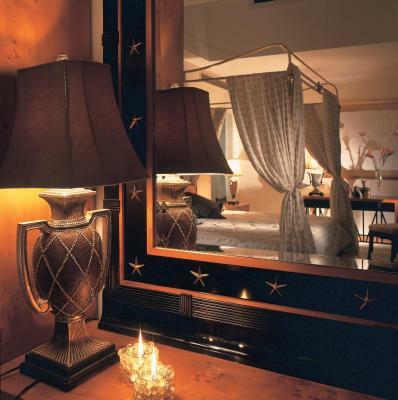 Special complimentary touches include fruit basket, bathrobe, slippers and daily newspaper. 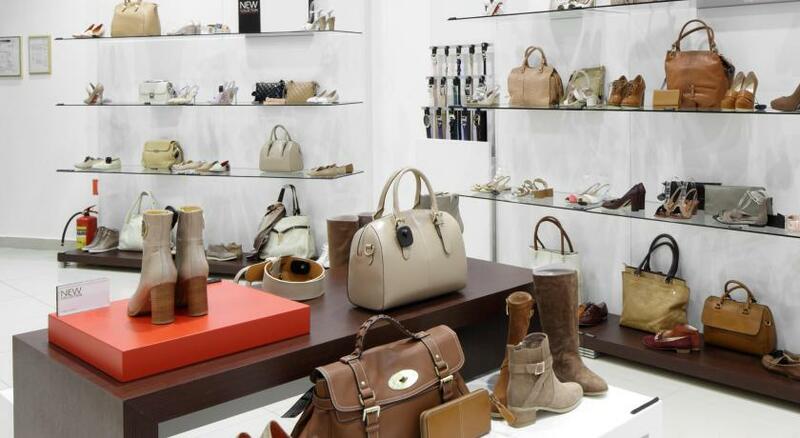 - A selection of local and international newspapers and magazines. Dedicated two meeting rooms for the executive guest at a charge. - Complementary WiFi access in the lounge. 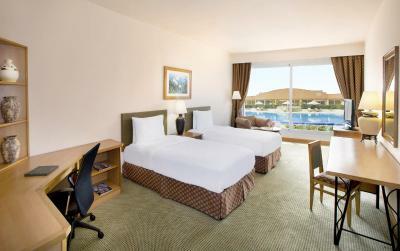 Overlooking the pool, this air-conditioned room features a flat-screen TV, a minibar and tea/coffee-making facilities. The private bathroom has a bathtub or shower with a handheld shower head, as well as slippers and complimentary toiletries. 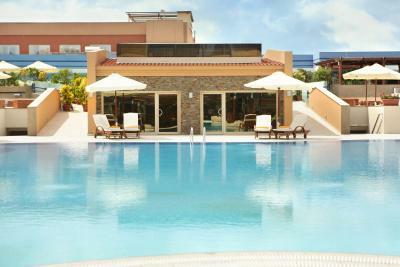 Overlooking the pool, this air-conditioned room offers a flat-screen TV, a mini-bar and a tea/coffee maker. 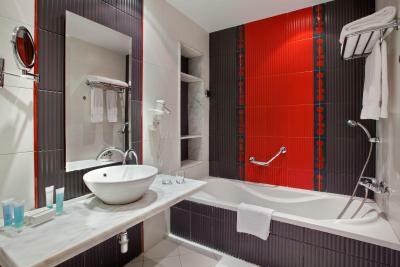 The room features a work desk and an elegant bathroom with separate shower. Stay connected with WiFi access (fees apply) or relax with cool drink from the mini-bar. Special touches include daily newspaper delivery. Sleeps 2 adults and 2 children under 12 years. 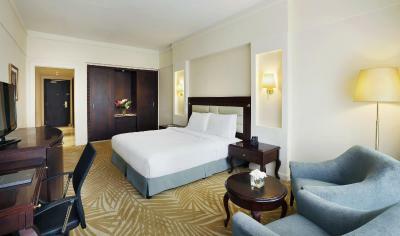 This air-conditioned suite offers added space and comfort in stylish surroundings with two king-sized beds. 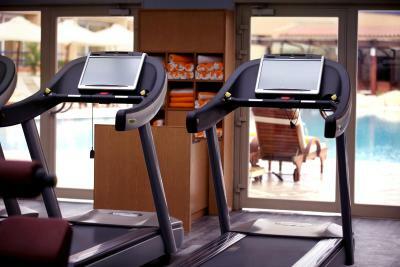 It offers 2 42-inch LCD TVs and complimentary complimentary mini bar. The room features a work desk and an elegant bathroom. Special touches include fruit basket, bathrobes, slippers and daily newspaper. Sleeps 4 adults or 2 adults and 2 children under 12 years. Special touches include fruit basket, bathrobes, slippers and daily newspaper. 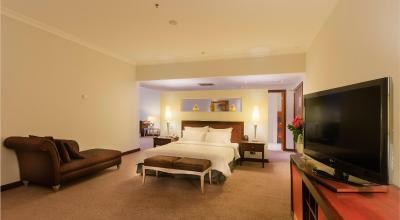 This air-conditioned suite offers a queen-sized bed, separate work area with large desk, living and dining areas. 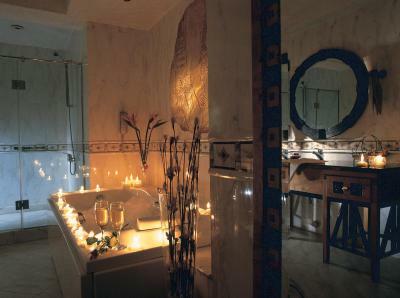 Stay connected with the WiFi access (fees apply) or enjoy a shower in the elegant bathroom. Special touches include fruit basket, bathrobes, slippers and daily newspaper. Sleeps 2 adults, 2 children under 12 years. 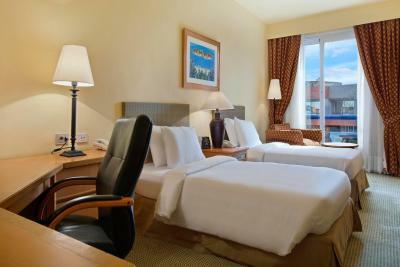 This spacious, air-conditioned suite offers a separate work area with large desk, as well as living and dining areas. 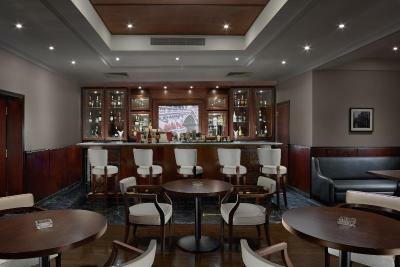 Guests can benefit from Executive Lounge access with private check-in and check-out area, complimentary breakfast, refreshments throughout the day, happy hour and WiFi access. 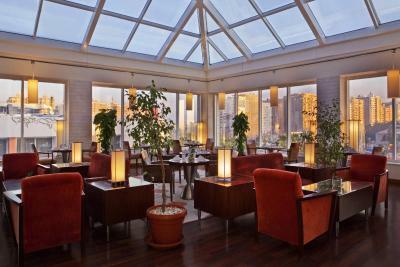 Benefit from Executive Lounge access with complimentary breakfast, snacks and refreshments all day. Executive Lounge access is for adults only. 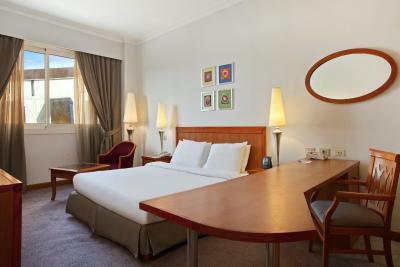 There is also an in-room dining and a flat-screen TV. Special touches include fruit basket, bathrobes, slippers and daily newspaper. Alexandria, the second largest city in Egypt has a Mediterranean charm that's hard to resist. 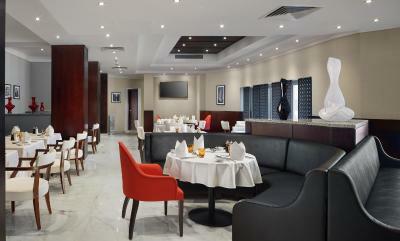 Hilton Alexandria Green Plaza is located in the business district of Smouha, just a 45-minute drive from the airport and boasts the largest ballroom and meeting space in the city, providing a relaxing experience for business and leisure guests alike. 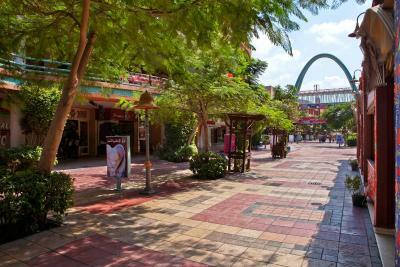 Located inside one of Egypt's largest shopping malls with its 380 shops, cinema complex and funfair, there's something to keep everyone happy. 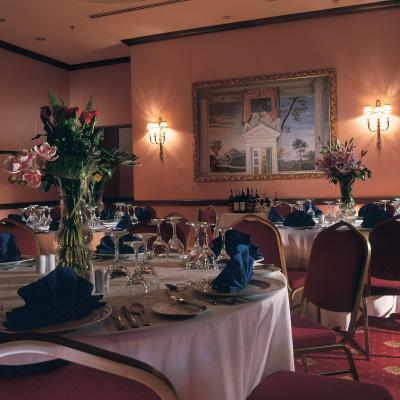 Our hotel features an Executive Lounge and 15 meeting rooms for 3,500 people. 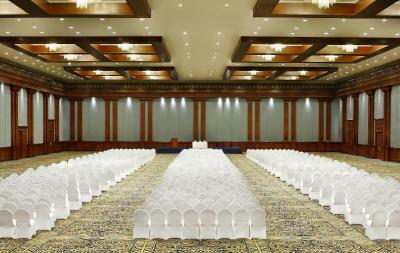 The Al-Zahraa Ballroom is amongst the largest conference rooms in Alexandria and features a grand foyer area. 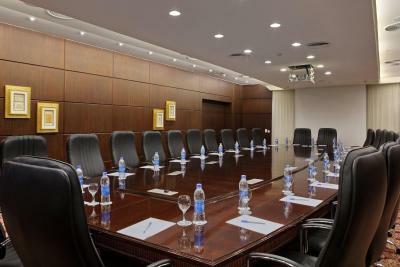 Equipped with modern facilities, Hilton Alexandria Green Plaza makes the perfect venue for your next conference, meeting, exhibition, fashion show, party, banquet or wedding in Alexandria. 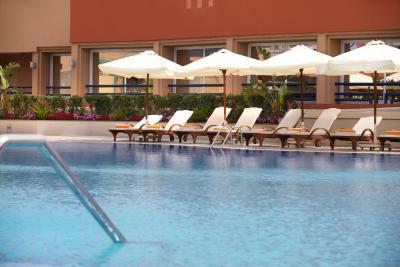 After a busy day shopping or working, relax in the pool, or sample the hotel's seven bars and restaurants. Explore the city and visit Alexandria attractions, such as the Bibliotheca Alexandrina or Qaitbay Fort. 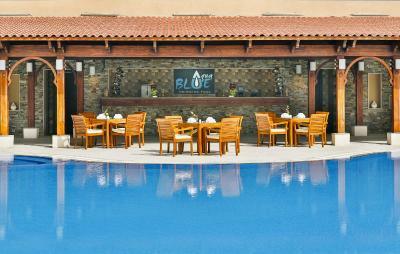 House Rules Hilton Alexandria Green Plaza takes special requests – add in the next step! 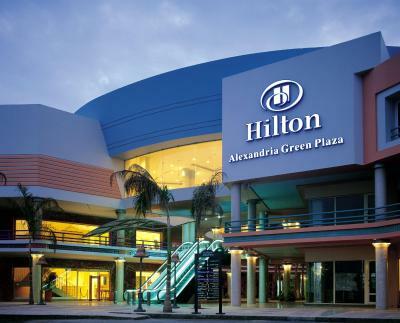 Hilton Alexandria Green Plaza accepts these cards and reserves the right to temporarily hold an amount prior to arrival. Children above 12 year only may access the executive lounge and should be accompanied by parents. Children are not allowed during Happy hours. The property is big and my room was too far from the entrance. Also, I had difficulty finding transportation as the drivers could not navigate the entrance and were not allowed in to the parking lot. Getting into and out of the hotel required too much walking.